The impending collapse of ISIS has touched off a race for territory in the oil-rich eastern part of Syria pitting US-backed forces against the Russian-led coalition of Syria, Iran and Hezbollah. This is the nightmare scenario that everyone wanted to avoid. Washington and Moscow’s armies are now converging on the same area at the same time greatly increasing the probability of a conflagration between the two nuclear-armed superpowers. The only way a clash can be avoided is if one party backs down, which seems increasingly unlikely. The situation can be easily explained. The vast swath of territory captured by ISIS is steadily shrinking due to the dogged perseverance of the Syrian Arab Army (SAA) which has liberated most of the countryside west of the Euphrates River including the former ISIS stronghold at Deir Ezzor, a critical garrison at the center of the fighting. ISIS is also getting pressure from the north where the US-backed SDF is pounding their capital at Raqqa while deploying troops and tanks southward to the oil fields in Deir Ezzor province. Washington has made it clear that it wants its proxy-army to control the area east of the Euphrates establishing a soft partition between east and west. The US also wants to control Deir Ezzor’s vast oil resources in order to provide a reliable revenue stream for the emergent Kurdish statelet. Syrian President Bashar al Assad has said many times that he will never agree to the partitioning of the country. But the decision will not be made by Assad alone. His coalition partners in Moscow, Beirut and Tehran will also help shape the final settlement. As far as Putin is concerned, it seems extremely unlikely that he’d risk a protracted and bloody war with the United States simply to recapture every square inch of Syrian territory. The Russian president will probably allow the US to keep its bases in the northeast provided that critical areas are conceded to the regime. But where will the line be drawn, that’s the question? This is a major setback for the Russian coalition. It means that the SAA backed by the Russian Airforce will have to fight a group which, up to this point, has been an ally in the war against ISIS. Now it’s clear that the mainly-Kurdish SDF is no ally, it’s an enemy that wants to steal Syria’s resources and carve a state out of its eastern flank. The news about the SDF’s arrival at the oil fields came just hours after the Russian Defense Ministry spokesman Major General Igor Konashenkov issued a terse warning to the US and SDF that Russia would retaliate if SAA positions were attacked again by SDF mortar or rocket fire. In retrospect, it looks like the SDF had already decided to make a clean break with the government leaving no doubt of where they stood. Washington is using the SDF to seize the oil fields and to claim to the entire east side of the Euphrates for its own. There’s no doubt that these combat units of the SDF are accompanied by US Special Forces who are providing critical communications, logistic and tactical support. This operation has Washington’s fingerprints all over it. On Friday morning, loyalist forces led by the 5th Assault Corps ISIS Hunters, established full control over Khusham village on the eastern bank of the Euphrates River near Deir Ezzor city. The strategically-located village blocks a key road linking the area held by the SDF to the Omar oil fields. Get the picture? US-backed forces and Russian coalition members are now operating cheek-to-jowl in the same theatre trying to seize the same oil-rich scrap of land. This has all the makings of a major head-on collision. Putin is a cautious and reasonable man, but he’s not going to hand over Syria’s oil fields without a fight. Besides, Assad needs the oil receipts to finance the rebuilding of his decimated country. Equally important, he needs the territory east of Deir Ezzor to for an overland route connecting Beirut to Damascus to Baghdad to Tehran, the so-called Arab Superhighway. Putin’s job is to glue as much of the country together as needed to create a viable state. So while he may allow the SDF and US military to occupy parts of the northeast, he’s not going to surrender crucial resources or strategically-located territory. So what does it all mean? 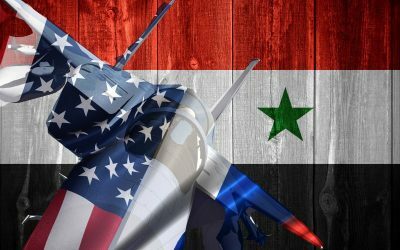 Does it mean that Russia will support Assad’s attempts to liberate the oil fields even if it could trigger a broader war with the United States? Putin doesn’t want a slugfest with Uncle Sam, but he’s not going to abandon an ally either. So there’s going to be a confrontation because neither party is willing to give up what they feel they need to achieve success.